How do springs work? | How do springs store energy? If you're like me and you love taking things to pieces, springs are your nemesis. Try putting a gadget or a machine back together again later and it's the springs that often defeat you: just where do they go and how on Earth do they fit back in again? In their most familiar form, springs are toughened coils of metal that help things return to a particular position, but they can also be used to absorb energy (as in car suspension) or store it for long periods of time (as in watches and clocks). You can find springs in everything from automatic doors to ballpoint pens. Let's take a closer look at how they work! Photo: Taut stainless steel coil springs on a desk lamp. Coil springs all have the same basic spiral shape but come in all sizes, from the tiny little ones you can find in ballpoint pens to the huge ones that wrap around shock absorbers on cars. 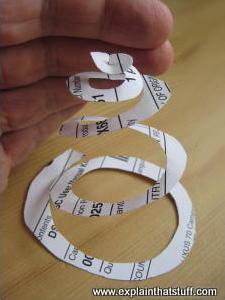 Photo: Make a paper spring by drawing a spiral on some paper or card. Then simply cut round the line with a pair of scissors. You'll be surprised how springy this spring is! A typical spring is a tightly wound coil or spiral of metal that stretches when you pull it (apply a force) and goes back to its original shape when you let it go again (remove the force). In other words, a spring is elastic. I don't mean it's made from rubber; I mean that it has elasticity: it gets longer when stress is applied but (providing you don't stretch it too much) returns exactly to its original length when that stress is removed. Depending on how a spring is made, it can work in the opposite way too: if you squeeze it, it compresses but returns to its original length when the pushing force is removed. You can make a spring out of more or less anything—even paper or orange peel!—but the kinds of springs we use in machines work effectively only if they're stiff enough to resist a pulling force and durable enough to be stretched many times without breaking. Typically that means they have to be made from materials such as stainless steel or tough alloys such as bronze. Some alloys have a property called shape-memory, which means they're naturally springy. Eyeglass frames are often made from a nickel- titanium shape-memory alloy called nitinol, sold under brand names such as Flexon®. Imagine you have a piece of straight steel wire about 10cm (4 in) long—something like a long paperclip you've unwrapped. If you pull it with your fingers, it's extremely difficult to stretch it. Coil it around a pencil and with a bit of effort you can make yourself a small but perfectly functioning spring. Now pull or push it with your fingers and you'll find you can stretch and squeeze it quite easily. Photo: It's easy to make a simple coil spring from a paperclip. Why has this once-stubborn piece of metal suddenly become so cooperative? Why is a spring really easy to stretch and squeeze when the same piece of metal, in the form of a wire, was so reluctant to change shape in the first place? When the material is in its original form, stretching it involves tugging atoms out of their position in the metal's crystal lattice—and that's relatively hard to do. When you make a spring (as you'll discover if you try bending a paperclip), you have to work a little bit to bend the metal into shape, but it's nowhere near as difficult. As you bend the wire, you use energy in the process and some of that energy is stored in the spring; it's prestressed, in other words. Once the spring is formed, it's easy to change its shape a little bit more: the more windings of metal a spring has, the easier it is to stretch or squeeze it. You've only to shift each atom in a spiral spring by a small amount and the entire spring can stretch or squeeze by a surprising amount. 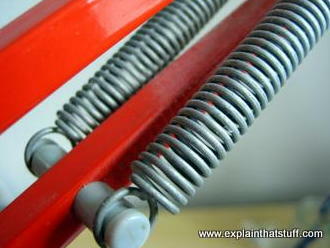 Springs are great for storing or absorbing energy. When you use a pushing or pulling force to stretch a spring, you're using a force over a distance so, in physics terms, you're doing work and using energy. The tighter the spring, the harder it is to deform, the more work you have to do, and the more energy you need. The energy you use isn't lost: most of it is stored as potential energy in the spring. Release a stretched spring and you can use it to do work for you. When you wind a mechanical clock or watch, you're storing energy by tightening a spring. As the spring loosens, the energy is slowly released to power the gears inside and turn the hands around the clockface for a day or more. Catapults and crossbows work in a similar way except that they use twists of elastic for their springs instead of coils and spirals of metal. Photo: Leaf springs provide crude suspension for this old railroad truck. You might think a spring is a spring is a spring—but you'd be wrong! There are several quite different kinds. The most familiar ones are coil springs (like the ones you find in pens and the one we made up above from a paperclip): cylinders of wire wrapped around a circle of fixed radius. Spiral springs are similar, but the coil gets progressively smaller as you reach the center; our paper spring is an example. The delicate hairspring that helps to keep time in a watch is another example of a spring like this. Torsion springs work like the elastic in a catapult or an elastic band twisted repeatedly between your fingers: proper ones are made from stiff pieces of metal that twist on their own axis. 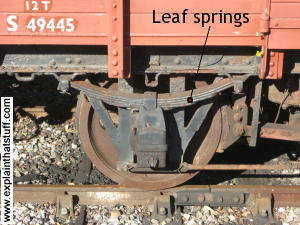 Leaf springs are stacks of curved metal bars that support the wheels of a car or railroad truck and bend up and down to smooth out the humps and bumps. Springs also vary in the way they resist forces or store energy. Some are designed to absorb energy and force when you squeeze them; their coils start off slightly extended and squash together when you apply a force, so they're called compression springs. The opposite happens with extension springs (sometimes called tension springs): they start off compressed and resist forces that try to stretch them. Torsion springs have horizontal bars at their two ends so they can resist something twisting or rotating. Animation: Compression springs are designed to absorb forces by squeezing together. Tension springs work the opposite way, stretching apart when you apply a force. Torsion springs have parallel bars on the end that stop something turning (or bring it back to its original position if it does). Not all springs work by stretching and squeezing pieces of metal, plastic, or another solid material. An entirely different design involves using a piston that moves back and forth in a cylinder of fluid (gas, liquid, or sometimes both), a bit like a bicycle pump that's very hard to push in and out. Read more about these in our article on gas springs. 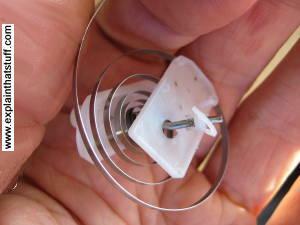 Photo: The mainspring from a clockwork toy. When you wind up the toy, you compress the spring into a much tighter space to store energy that's released when the toy starts to move. 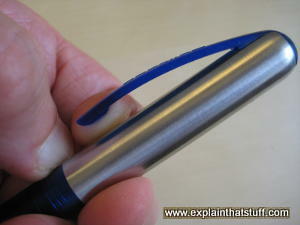 Open up a ballpoint pen (one of the ones with a button you click to retract the ball) and you'll find a spring inside. Look under a car and there are springs there too, helping the shock absorbers to smooth out the bumps in the road. There are springs in watches and clocks, as we've already seen. And there's a spring in a car speedometer (at least, one of the old-fashioned mechanical ones). Once you've started spring spotting, you'll find you can see springs everywhere! What materials are springs made from? Photo: When is a spring not a spring? Lots of everyday things need "spring" even if they're not springs. For example, the plastic lapel clip of this fountain pen is designed to flex (to an extent) so it stays firmly in your pocket. It's not a spring as such, but it's been carefully designed in exactly the same way. Springs are generally made from spring steels, which are alloys based on iron, with small amounts of carbon (around 0.6–0.7 percent), silicon (0.2–0.8 percent), manganese (0.6–1 percent), and chromium (0.5–0.8 percent). The exact composition of a spring steel depends on the properties you want it to have, which will include the loads it will needs to withstand, how many cycles of stresses and strain it will undergo, the temperatures it has to operate under, whether it needs to withstand heat or corrosion, how well it needs to conduct electricity, how "plastic" (easy to shape) it needs to be during its initial manufacture and shaping, and so on. Generally, springs are made from steels with a medium to high carbon content (that means a tiny amount of carbon in the total mix, but more than you'd find in other kinds of steel). They're usually given some form of heat treatment, such as tempering, to ensure they're strong and can withstand many cycles of stresses and strain—in other words, so you can stretch or squeeze them many times without them breaking. Springs usually fail through metal fatigue, which means they suddenly crack after being repeatedly moved back and forth. At the microscopic level, no spring is truly elastic: every time it goes through a stretching cycle (stretching or compressing and then returning to its original size), its internal structure is altering very slightly and tiny "microcracks" may be forming and growing inside it. At some point in the future, it will definitely fail: the spring will break when a crack grows big enough. Materials science teaches us that how springs are made is hugely important in making them last. For example, if you don't use the correct hardening temperature when the steel is being made, you'll produce weaker steel—and a weaker spring that's likely to fail more quickly. Magnets and Springs by Carol Ballard. Hachette, 2014. A 32-page guide (grades 2–4, ages 7–9). You might wonder why magnets and springs are covered together; that just happens to be how some science curricula teach it. Springs by Angela Royston. Heinemann/Raintree, 2003. For younger readers (grades 2–4, ages 7–9). Materials for Springs by Y. Yamada. Springer, 2007. Describes the qualities needed for different types of springs and the various metals, alloys, and other materials (plastics, composites, ceramics, and so on) used to make them. For professional engineers and engineering students. Materials Selection in Mechanical Design by Michael F. Ashby. Butterworth-Heinemann, 2016. A good introduction to the idea of using materials science in engineering. US Patent 3,468,527: Coil spring by Glenn Mather, North American Rockwell/Boeing, 1968. An interesting technical insight into how coil springs are engineered. Flexon is a registered trademark of Marchon Eyewear, Inc.